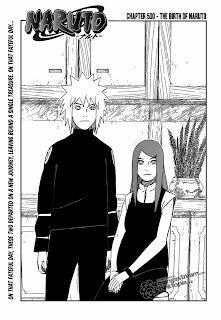 Naruto Manga Chapter 500 The Birth of Naruto is already out. Naruto finally know the truth about his mother that she was the nine tails jinchuuriki. His mom was brought to the leaf village for the express purpose of becoming a jinchuuriki and was chosen as the second nine tails jinchuuriki. Khusina explain her son about her village and their special ability on sealing techniques. Its also reveal that the mark in naruto's back is the symbol of the hidden eddy village. From her mother's long explained Naruto understands that he don't need feel sad anymore as Jinchuuriki. The most suprised story was about the fox attacked the leaf 16 years ago. As we know the one who has controlled the nine tails is Uchiha Madara, but I don't think that it was still sealed inside Kushina. It could be happened because Madara knew one moment when jinchuuriki's seal is at its weakest. It was when Naruto's birth. It is Very interesting story, I couldn't tell you the rest of the story. Just read by your self, lol.